All photos courtesy of Lisa Lee. The first portion of the monster, 13-day Georgia On My Mind circuit wrapped with a whopping 5,000 entries in Conyers, GA. 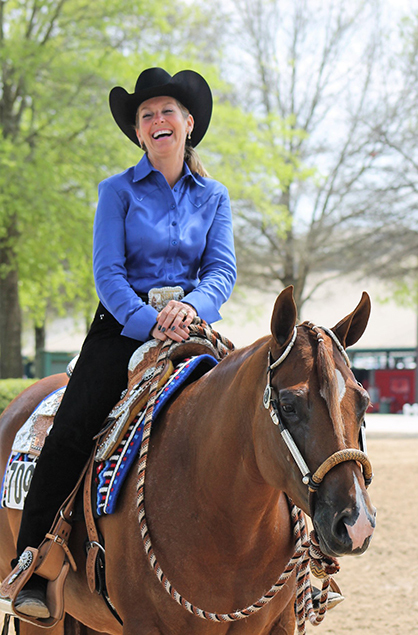 The first part of the show began April 5th with the Horseman’s Quarter Horse Association of Georgia Stock Show. Judges were Mike Edwards, John Boxell, Doug Huls, Gayle Lampinen, Mike Weaver, Chris Jones, Ryan Kail, Larry Little, Clint Fullerton, Michael Ochetto, Christa Baldwin, and Amy Watkins. The next portion of the show is the Pro Am Circuit that will continue through the 14th with judges Eric Petersen, Tina Anderson, Kelly Chapman, John Briggs, Sandy Curl, Rhonda Replogle, Jeff Greaves, Tom Robertson, Jackie Krshka, Brad Jewett, Kerry Allen, and Stacey Roberson. For exhibitors who choose to compete at both shows, there is the opportunity to win some “Georgia Gold” with $30,000 up for grabs in 3-year-old Western Pleasure, Limited Open Western Pleasure, and Hunter Under Saddle classes. In addition, there is an estimated $30,000 available in the $10,000 Kim Rich Memorial/Green Western Pleasure. Congratulations to the following High Point winners at the HQHA Stock Show! Phat Tuesday was named the Junior Champion for owner, Bussing Performance Horses, with Brad and Carli Pitts in the saddle. The Reserve Champion was Aint Too Lazy, ridden by Brad and Carli Pitts for Taylor Leone. The Senior Champion was Hotroddin Ona Harley, ridden by Clint Ainsworth for Meg DePalma Whelan. The Reserve Champion was Sleepin In On Sunday, ridden by Shane Young for Taylor Leone. The Level 1/Green Champion was Fortunateson, ridden by Stephanie Armellini for Sheri Kern. The Reserve Champion was No Time For Sleepin, ridden by Colton Lasusa for Karen Cias. The Level 1/Novice Amateur Champion was Taylor Kungle with Krymsun Belle. The Reserve Champion was Denise McCormick with Cool Lopin Lady. The Amateur Champion was Rachel Trebseh with No Doubt I Shine. 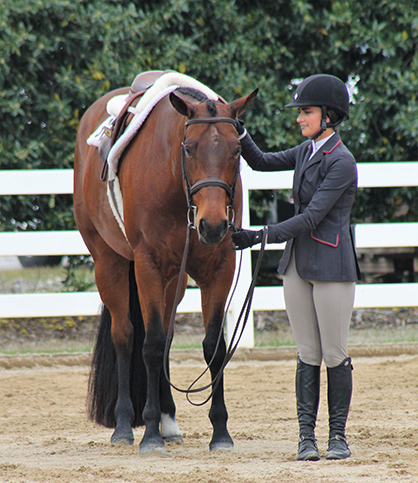 The Reserve Champion was Meg DePalma Whelan with Hotroddin Ona Harley. The Select Champion was Marty Hayes with Sleepy Lil Rascal. The Reserve Champion was Debra Craig with PF Put It N Park. The Level 1/Novice Youth Champion was Isabella Buckley with Roses Only. The Reserve Champion was Karlie Welch with Hez Just Got It. The Youth 13 & Under Champion was Cheyenne Augsburger with Huntin For Candy. The Reserve Champion was Isabella Buckley with Roses Only. The 14-18 Champion was Jillian Stopperich with One Hot Big Leaguer. The Reserve Champion was Savannah Relick with Goodbar Had A Dream. The Small Fry Champion was Quincy Clagg with Vallejo ZipnTil Dark. The Reserve Champion was Lena Slater with Venture Assets. The Level 1 Amateur Walk/Jog Champion was Gail Burke with Its Hot In Ocala. 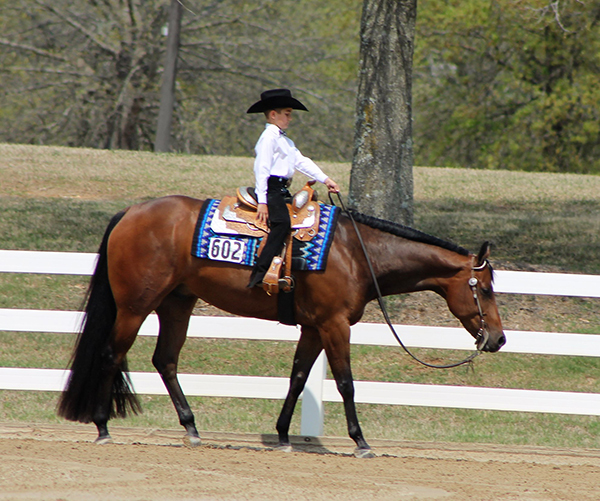 The Reserve Champion was Rebecca McBath with Ima Final Version. The Level 1 Youth Walk/Jog Champion was Lena Slater with Venture Assets. The Reserve Champion was Gracie Slater with Hot Hip N Radical. The Versatility Ranch Horse Amateur Champion was Jennifer Bateman with CHF Hotroddin Sarah. The Amateur Fence Champion was Hannah Bedwell with Desert Party. The Reserve Champion was Taylor Dahl with Art Smart. The Open Fence Champion was Cloaked In Honor for Madison Schneider. The Reserve Champion was Desert Party for Hannah Bedwell. Click on the links below to view complete results from the HQHA Stock Show. Click here to view photos, courtesy of Lisa Lee.